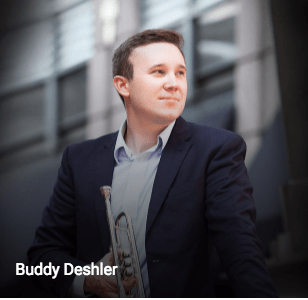 Trumpet soloist Buddy Deshler is an ambassador for the transformative powers of the arts, champion of living composers, and agent for change in the instrumental music field. His bourgeoning career has taken him around the country, as well as internationally, and has allowed him to share the stage with ensembles such as the King’s Brass, The Rodney Marsalis Philadelphia Big Brass, and his own Vice City Brass and Marquee Brass. His musical endeavors have given him guidance and association with artists like Jose Sibaja, Chris Castellanos, Demondrae Thurman, Jens Lindemann, Maniacal 4 Trombone Quartet, Martin Hackleman, Sam Pilafian, Larry Williams, Mary Bowden, Shawn Hagen, Andrew Hitz, Lance LaDuke, Rex Richardson, Matt Niess, Kevin Gebo, Phil Snedecor among many others. As a performing artist for Jupiter’s XO Brass and Denis Wick of London, Mr. Deshler tours nationally, conducting lectures and clinics everywhere from middle school through college students. His educational programs and masterclasses focus on sound pedagogical approaches to practice and the business acumen necessary for a modern career in music. His clinic “The Entrepreneurial Student” instills the idea that one can develop and execute the skills necessary to jump start a career in music while still being a “student”. Additionally, Mr. Deshler uses his platform as a performing artist to showcase the talents of emerging composers. In 2015, he mounted the inaugural “Well That’s a First!” The recital featured commissions by five young composers, who were the direct recipients of all proceeds. Mr. Deshler has commissioned over a dozen works for solo trumpet, and various chamber ensembles. As an educator, Mr. Deshler serves as the Artistic Director and Co-Founder of “The Fredericksburg Brass Institute”, a weeklong summer music festival offering a rich immersion in master classes and seminars, large and small ensembles, instrument exhibits, participant recitals and free concerts featuring renowned guest artists. Mr. Deshler presently resides in Baltimore, MD as an active freelance musician and educator. He holds a B.M. in Instrumental Performance and an Artist Diploma from the Frost School of Music, University of Miami and is a M.M. candidate at the Peabody Institute, Johns Hopkins University. His primary teachers have included Dennis Edelbrock, Phil Snedecor, Craig Morris, and Josef Burgstaller. This summer, Buddy will be performing clinics and soloing in Texas, Florida, and Pennsylvania as well as teaching at FredBrass at the Northampton Community Music Center in Northampton Massachusetts. Mr. Deshler will also be traveling to the United Kingdom to play with the Foden’s Brass Band as well as touring with his Miami based chamber ensemble, The Vice City Brass. For more information about Buddy Deshler, visit his website at www.buddydeshler.com and find him social media!